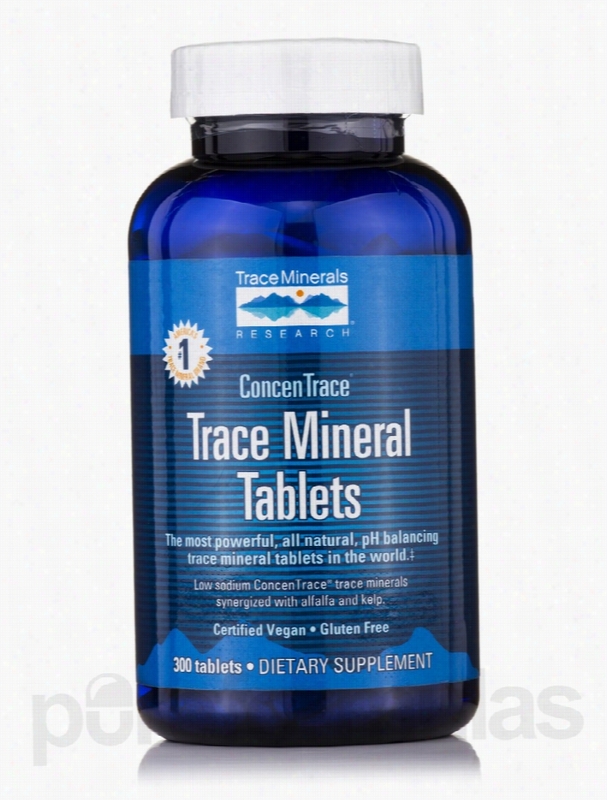 Trace Minerals Research Minerals - Trace Minerals - 300 Tablets. Low sodium ConcenTrace&reg; Trace Mineral Tablets is the most powerful natural Health mineral supplement in the world. It's impossible to underestimate the importance of minerals and trace minerals for the human body. They are the catalysts for all the vitamins and other nutrients your body uses for developing and maintaining good health. ConcenTrace&reg; Trace Mineral Tablets captures the perfect balance of those minerals. Using ConcenTrace&reg; every day will help renew and energize your body's entire electrical system. You'll have more energy and will generally feel better. Why is ConcenTrace&reg; so powerful? Extracted from the Great Salt Lake&sbquo; ConcenTrace&reg; contains a full spectrum of all the minerals in a balance natural to the body. Once extracted&sbquo; we use a completely natural concentration process that removes the sodium from the Great Salt Lake water. The result of this natural process is ConcenTrace&reg;&sbquo; an all natural ionic trace mineral blend that is 26 times more concentrated than colloidal trace minerals&sbquo; making it one of the most naturally powerful health supplements on the market.Product Highlights:- The most powerful&sbquo; all natural&sbquo; pH balancing trace mineral tablets in the world.- Low sodium ConcenTrace&reg; trace minerals synergized with alfalfa and kelp.- Certified Vegan.- Gluten Free.- Contains over 72 ionic trace minerals. These statements have not been evaluated by the Food and Drug Administration (FDA). These products are not meant to diagnoseÃ¢ÂÂ treat or cure any disease or medical condition. Please consult your doctor before starting any exercise or nutritional supplement program or before using these or any product during pregnancy or if you have a serious medical condition. 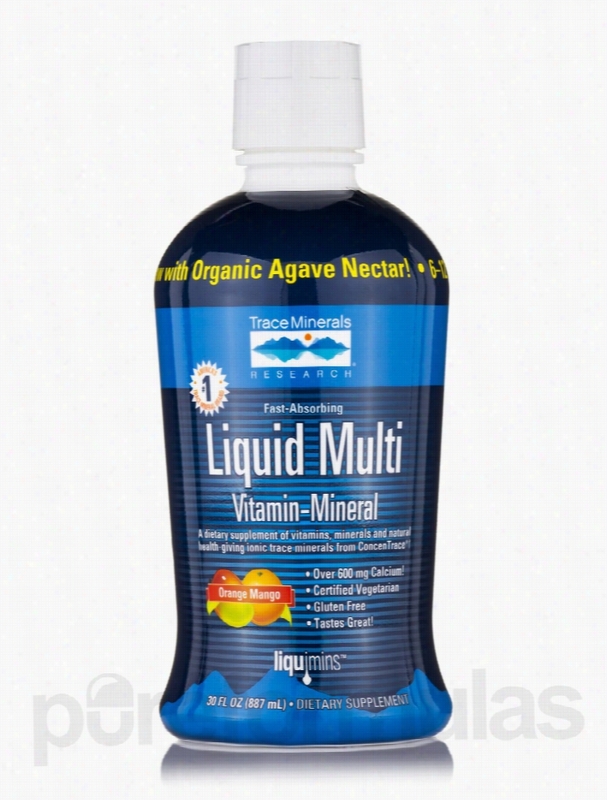 Trace Minerals Research Men's Health - Liquid Multi Vitamin-Mineral. Liquid Multi Vitamin-Mineral with ConcenTrace&reg; is a powerful dietary supplement formulated for the nutritional needs of men and women. They supercharged the formula with over 72 ionic trace minerals from ConcenTrace&reg;.- Contains over 90 nutrients.- Organic Agave Nectar.- 600 mg Calcium.- B complex vitamins.- Antioxidant Vitamins.- Amino Acids.- Certified Vegetarian.- Gluten Free.- Tastes Great.This great tasting liquid blend has been formulated with essential vitamins and minerals for prenatal nutrition&sbquo; mature bone Health&sbquo; and increased energy and stamina. Imagine a complete synergistic daily supplement so powerful that many people feel a difference the very first day. Liquid Multi Vitamin-Mineral is the most complete&sbquo; all-in-one liquid daily supplement that combines the benefits of multiple vitamins with the advantages of ionic trace minerals to replace those needed minerals not found in processed foods. The ionic trace minerals act as catalysts for all the nutrients found in Liquid Multi Vitamin-Mineral. Product Highlights:- Berry Flavor.- 6-12 times the Calcium of leading liquid multi's.- Now with Organic Agave Nectar.ConcenTrace&reg; is a trade name for concentrated sea minerals from the Great Salt Lake. These statements have not been evaluated by the Food and Drug Administration (FDA). These products are not meant to diagnoseÃ¢ÂÂ treat or cure any disease or medical condition. Please consult your doctor before starting any exercise or nutritional supplement program or before using these or any product during pregnancy or if you have a serious medical condition. 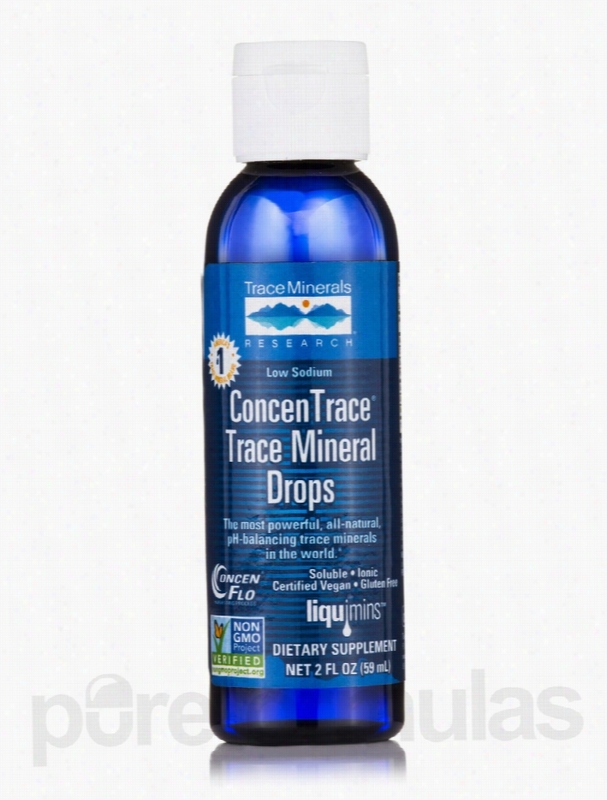 Trace Minerals Research Joint Support - Low Sodium ConcenTrace Trace. 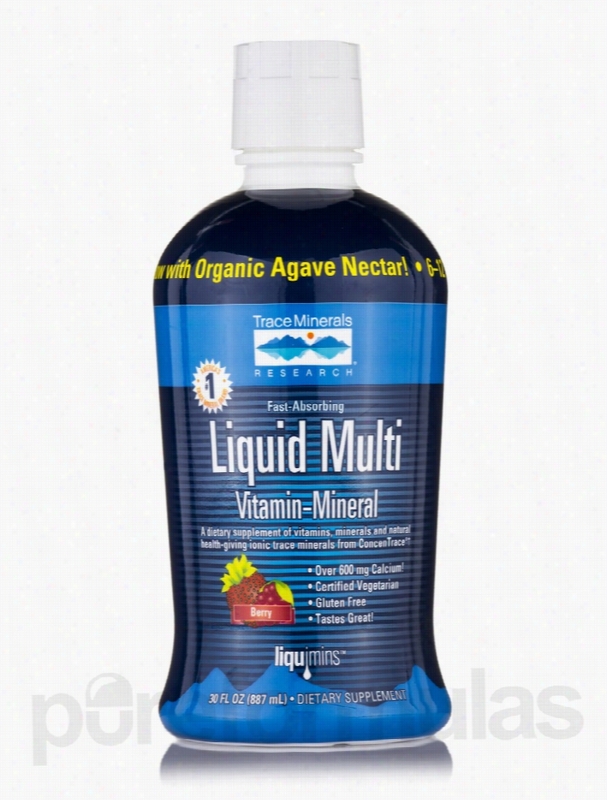 Trace Minerals Research Joint Support - Liquid Multi Vitamin-Mineral. Liquid Multi Vitamin-Mineral with ConcenTrace&reg; is a powerful dietary supplement formulated for the nutritional needs of men and women. They supercharged the formula with over 72 ionic trace minerals from ConcenTrace&reg;.- Contains over 90 nutrients.- Organic Agave Nectar.- 600 mg Calcium.- B complex vitamins.- Antioxidant Vitamins.- Amino Acids.- Certified Vegetarian.- Gluten Free.- Tastes Great.This great tasting liquid blend has been formulated with essential vitamins and minerals for prenatal nutrition&sbquo; mature bone health&sbquo; and increased energy and stamina. Imagine a complete synergistic daily supplement so powerful that many people feel a difference the very first day. Liquid Multi Vitamin-Mineral is the most complete&sbquo; all-in-one liquid daily supplement that combines the benefits of multiple vitamins with the advantages of ionic trace minerals to replace those needed minerals not found in processed foods. The ionic trace minerals act as catalysts for all the nutrients found in Liquid Multi Vitamin-Mineral. Product Highlights:- Orange-Mango Flavor.- 6-12 times the Calcium of leading liquid multi's.- Now with Organic Agave Nectar.ConcenTrace&reg; is a trade name for concentrated sea minerals from the Great Salt Lake. These statements have not been evaluated by the Food and Drug Administration (FDA). These products are not meant to diagnoseÃ¢ÂÂ treat or cure any disease or medical condition. Please consult your doctor before starting any exercise or nutritional supplement program or before using these or any product during pregnancy or if you have a serious medical condition. 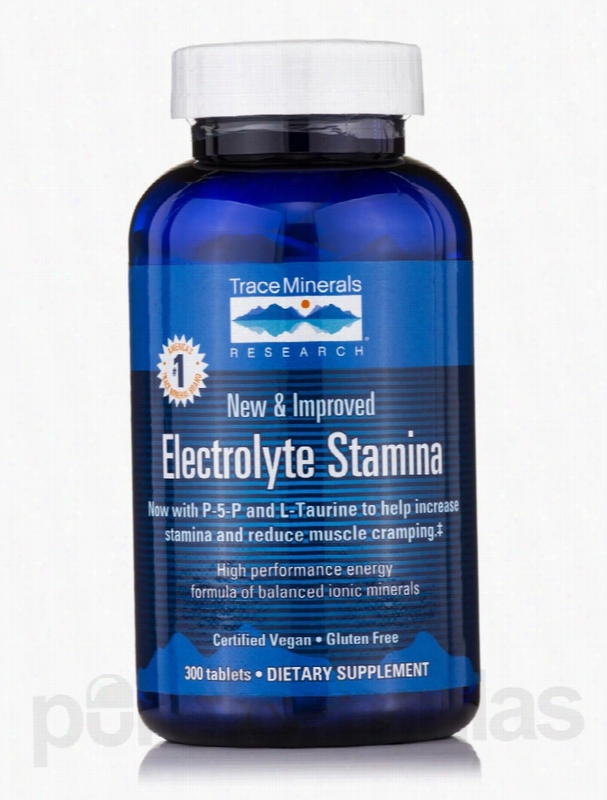 Trace Minerals Research Energy - Electrolyte Stamina - 300 Tablets. High Performance Energy Formula of Balanced Ionic Minerals.- P-5-P and L-Taurine to help increase stamina and reduce cramping!- Sodium&sbquo; Potassium&sbquo; Calcium&sbquo; Magnesium&sbquo; &amp; Chloride for efficient hydration.- ConcenTrace&reg;.- High performance energy formula of balanced ionic minerals.- Certified Vegan.- Gluten Free.New &amp; Improved Electrolyte Stamina is a dietary supplement that is ideal for sports performance&sbquo; people working in high temperatures&sbquo; and anyone expecting to experience high levels of fluid loss. P-5-P and L-Taurine help get magnesium into the cells more effectively to help reduce cramps and increase stamina and energy. You may expect a wide spectrum of nutritional benefits.Electrolyte Stamina Tablets replenish your body&rsquo;s lost nutrients during activity so you can perform at your best. These nutrients help conduct the electrical energies and balance fluid absorption and pressure throughout the body so you can feel recharged.In fact&sbquo; by taking Electrolyte Stamina Tablets after a hard workout (or during periods of hot weather)&sbquo; we guarantee you&rsquo;ll feel a difference within 60 minutes or we&rsquo;ll refund your money with no questions asked.Other electrolyte products consist of only a few electrolytes. Our Electrolyte Stamina Formula is packed with not only the major electrolytes&sbquo; but all the minerals in electrolyte form and balance &ndash; with no sugar or sucrose. So you get the natural goodness of every mineral and trace mineral as they interact in perfect balance to help maintain optimum health.It&rsquo;s a totally natural way to replace lost nutrients and help you re-energize.For over 35 years&sbquo; Trace Minerals Research&reg; has been providing high quality nutritional supplements to the natural products industry. These statements have not been evaluated by the Food and Drug Administration (FDA). These products are not meant to diagnoseÃ¢ÂÂ treat or cure any disease or medical condition. Please consult your doctor before starting any exercise or nutritional supplement program or before using these or any product during pregnancy or if you have a serious medical condition. 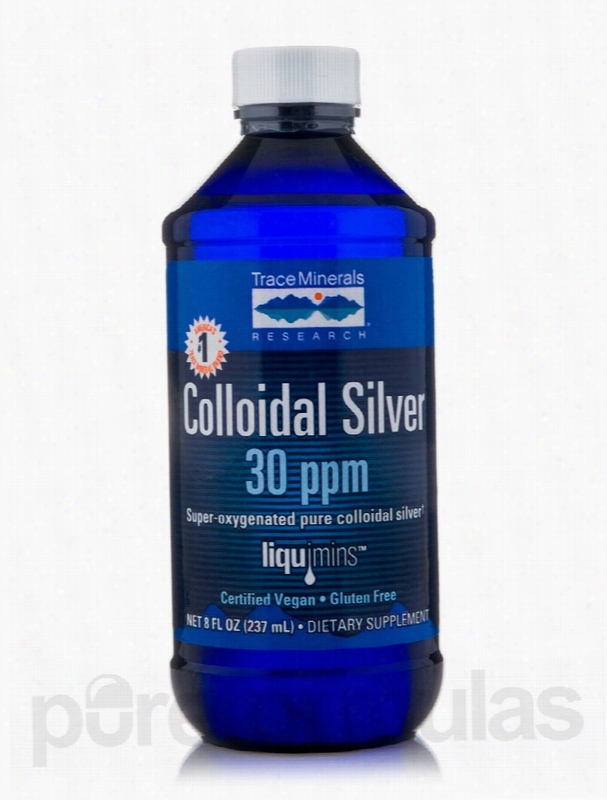 Trace Minerals Research Immune Support - Colloidal Silver 30 ppm - 8. Colloidal Silver is a dietary supplement with over 30 ppm per serving of 99.999% pure colloidal silver to support and maintain a healthy immune system. They use proprietary technology to process this high quality Colloidal Silver for maximum effectiveness. You may expect a wide range of nutritional benefits.- Non-GMO.- Fast Absorbing Liquid Formula.- Super Oxygenated Pure Colloidal Silver.- Vegan. These statements have not been evaluated by the Food and Drug Administration (FDA). These Products are not meant to diagnoseÃ¢ÂÂ treat or cure any disease or medical condition. Please consult your doctor before starting any exercise or nutritional supplement program or before using these or any product during pregnancy or if you have a serious medical condition. Pure Encapsulations Minerals - Trace Minerals - 60 Capsules. Unfortunately, PureFormulas is not allowed to sell/ship this brand to international destinations. Your body requires an array of trace Minerals in order to function properly. While these minerals are only needed in small amounts&sbquo; that doesn't make them any less necessary. Iodine&sbquo; copper&sbquo; zinc&sbquo; selenium&sbquo; manganese&sbquo; boron&sbquo; silica&sbquo; vanadium&sbquo; and chromium are among the trace minerals you need. They can help support the metabolism of nutrients&sbquo; which allows your body to absorb and benefit from the vitamins and minerals contained in foods or other supplements. In general&sbquo; trace minerals promote increased cellular energy production. As a result&sbquo; you may end up less likely to feel fatigued. They also help synthesize DNA&sbquo; hormones&sbquo; and neurotransmitters. For example&sbquo; copper works to support the development of cartilage and bones. Meanwhile&sbquo; zinc can promote tissue repair&sbquo; while selenium may protect cell membranes from deteriorating. Manganese plays a role in antioxidant reactions&sbquo; and iodine supports the thyroid gland. Molybdenum is a particularly important element. The metal is involved in biological processes such as nervous system development&sbquo; using enzymes to break down amino acids&sbquo; and processing waste in the kidneys. This supplement provides a unique form of molybdenum called TRAACS&reg;&sbquo; a more easily absorbed glycinate chelate. 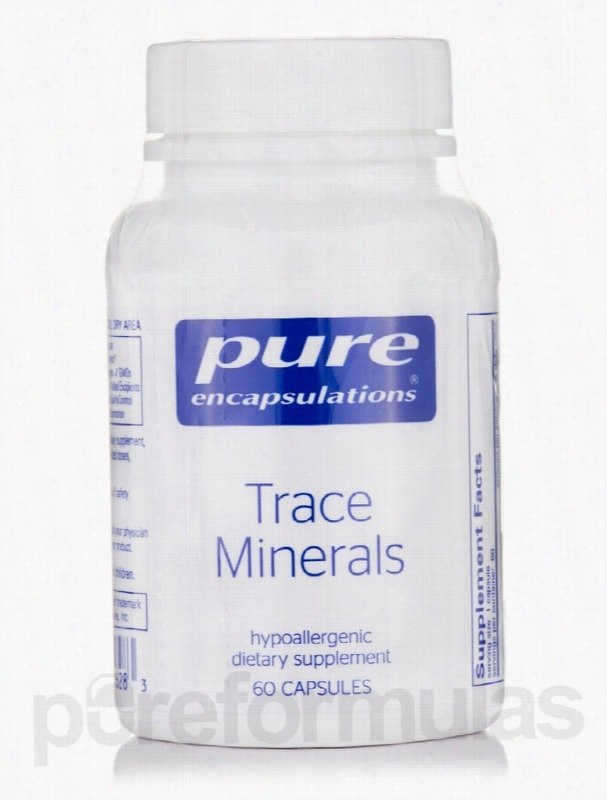 Trace Minerals by Pure Encapsulations is a convenient supplement to ensure sufficient intake. This blend of essential trace minerals provides them in balanced quantities to support overall effectiveness. Unlike other products&sbquo; Trace Minerals Capsules don't contain the more famous macrominerals. Macrominerals can interfere with the absorption and bioavailability of trace minerals when in the same supplement. Take one or two vegetable capsules daily&sbquo; in divided doses with meals. At the recommended dosage&sbquo; each 60-capsule bottle of Pure Encapsulations' Trace Minerals should last from one to two months. Pure Encapsulations seeks to formulate and manufacture high-quality&sbquo; hypoallergenic dietary supplements. Quality control during the formulation and manufacturing process is paramount. All Pure Encapsulations products are made with the most bioavailable ingredients possible. These statements have not been evaluated by the Food and Drug Administration (FDA). These products are not meant to diagnoseÃ¢ÂÂ treat or cure any disease or medical condition. Please consult your doctor before starting any exercise or nutritional supplement program or before using these or any product during pregnancy or if you have a serious medical condition. Trace Minerals Research Energy - Electrolyte Stamina Power Pak with. 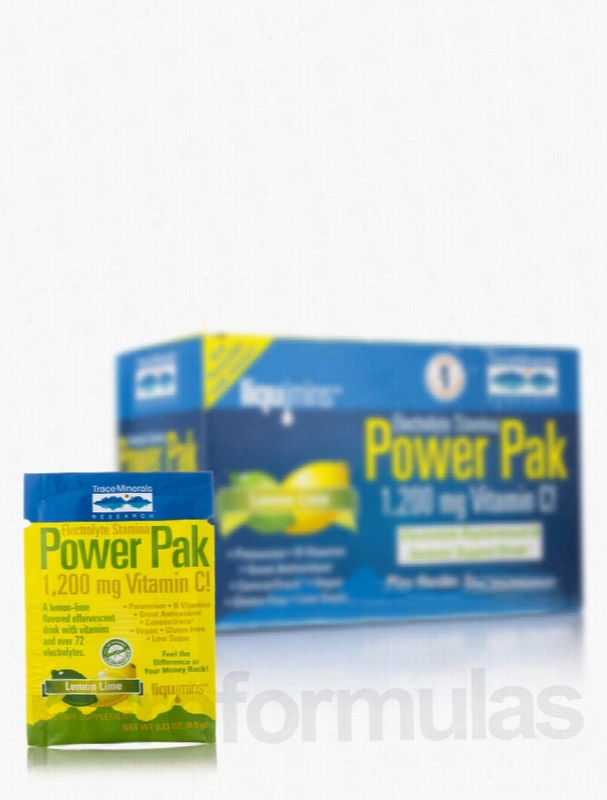 Electrolyte Stamina Power Pak with 1200 mg Vitamin C (Lemon Lime Flavor) &ndash; Box of 32 Packets (0.23 oz / 6.5 Grams each) from Trace Minerals Research&reg; may be a good source of Vitamin C to rejuvenate your body. This product contains vitamin C in the form of ascorbic acid&sbquo; thiamine&sbquo; riboflavin&sbquo; niacinamide&sbquo; vitamin B6&sbquo; folic acid&sbquo; vitamin B12&sbquo; pantothenic acid&sbquo; calcium&sbquo; magnesium&sbquo; zinc&sbquo; selenium&sbquo; chromium and other such minerals. Electrolytes may help in maintaining fluid balance in the body. Vitamin C in this supplement from Trace Minerals Research&reg; is well known for its antioxidant properties that may help in the healthy functioning of the body and re-energize the cells. The ionic minerals present in the formulation may help in easy absorption and assimilation of Essential minerals&sbquo; vitamins and nutrients by the body. The product may also help in maintaining the pH balance in the body. Re-energize your body with Electrolyte Stamina Power Pak with 1200 mg Vitamin C (Lemon Lime Flavor) &ndash; Box of 32 Packets (0.23 oz / 6.5 Grams each) from Trace Minerals Research&reg;! These statements have not been evaluated by the Food and Drug Administration (FDA). These products are not meant to diagnoseÃ¢ÂÂ treat or cure any disease or medical condition. Please consult your doctor before starting any exercise or nutritional supplement program or before using these or any product during pregnancy or if you have a serious medical condition. BrainChild Nutritionals Minerals - Spectrum Support Minerals - 180. 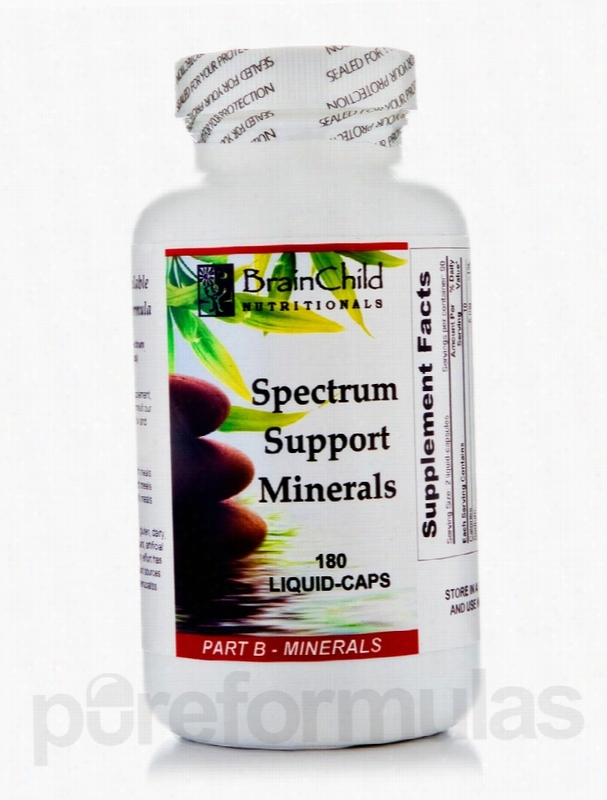 Spectrum Support Minerals Liquid-Capsules from BrainChild Nutritionals may provide the minerals required by your body&sbquo; in easy to assimilate capsules. The body needs vitamins&sbquo; minerals&sbquo; proteins&sbquo; and many other nutrients to stay healthy. A supplement like this one from BrainChild Nutritionals contains most of the important minerals that are Essential for the efficient function of the organs. Some of the minerals provided include calcium&sbquo; magnesium&sbquo; selenium&sbquo; chromium&sbquo; molybdenum&sbquo; and Methyl-Sulfonyl-Methane (MSM). Calcium is important for the growth and maintenance of healthy bones&sbquo; teeth&sbquo; and nails. Magnesium might help the nerves and muscles relax&sbquo; while selenium is said to play an important role in the body&rsquo;s metabolism. Molybdenum is also an essential mineral that plays a role in different biological functions. MSM is an organic sulfur compound and is considered the third largest nutrient found in the human body. It might help with the formation of chondroitin sulfates&sbquo; required for joint health. MSM may also be beneficial for bone health and might support various joint related problems. Spectrum Support Minerals Liquid-Capsules from BrainChild Nutritionals are an extremely bioavailable liquid form of minerals that can be easily assimilated for improved benefits. These statements have not been evaluated by the Food and Drug Administration (FDA). These products are not meant to diagnoseÃ¢ÂÂ treat or cure any disease or medical condition. Please consult your doctor before starting any exercise or nutritional supplement program or before using these or any product during pregnancy or if you have a serious medical condition. 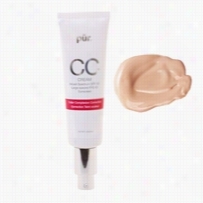 Pur Minerals CC Cream Medium 1.5 oz. MediumPur Minerals CC Cream is your multi-tasking Moisturizer, brightener, primer, concealer and SPF foundation! More than just another beauty balm, CC Cream with SPF 40 protects, corrects and perfects the skin's appearance with clinically advanced plant-based ingredients, like Dermapur HP, a clarifying corrective from Meadowsweet and Clariskin II, a brightening powerhouse from Wheat Germ. Ideal for all skin types and concerns, this silicone-free formula works to erase brown spots, blemishes and fine lines from sight while balancing uneven skin tone.Benefits:Provides SPF 40 sun protection.Contains a color-correcting brightener.Helps to control blemishes.Can be used by all skin types.